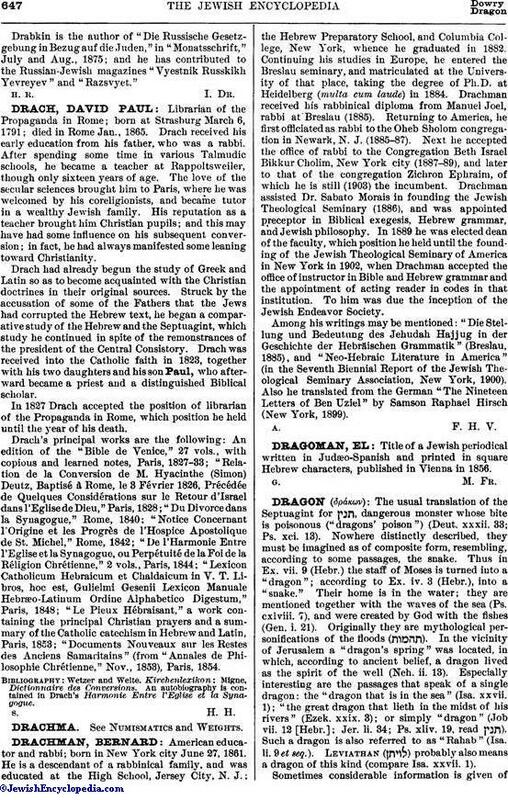 Librarian of the Propaganda in Rome; born at Strasburg March 6, 1791; died in Rome Jan., 1865. Drach received his early education from his father, who was a rabbi. After spending some time in various Talmudic schools, he became a teacher at Rappoltsweiler, though only sixteen years of age. The love of the secular sciences brought him to Paris, where he was welcomed by his coreligionists, and became tutor in a wealthy Jewish family. His reputation as a teacher brought him Christian pupils; and this may have had some influence on his subsequent conversion; in fact, he had always manifested some leaning toward Christianity. Drach had already begun the study of Greek and Latin so as to become acquainted with the Christian doctrines in their original sources. Struck by the accusation of some of the Fathers that the Jews had corrupted the Hebrew text, he began a comparative study of the Hebrew and the Septuagint, which study he continued in spite of the remonstrances of the president of the Central Consistory. Drach was received into the Catholic faith in 1823, together with his two daughters and his son Paul, who afterward became a priest and a distinguished Biblical scholar. In 1827 Drach accepted the position of librarian of the Propaganda in Rome, which position he held until the year of his death. Drach's principal works are the following: An edition of the "Bible de Venice," 27 vols., with copious and learned notes, Paris, 1827-33; "Relation de la Conversion de M. Hyacinthe (Simon) Deutz, Baptisé à Rome, le 3 Février 1826, Précédée de Quelques Considérations sur le Retour d'Israel dans l'Eglise de Dieu," Paris, 1828; "Du Divorce dans la Synagogue," Rome, 1840; "Notice Concernant l'Origine et les Progrès de l'Hospice Apostolique de St. Michel," Rome, 1842; "De l'Harmonie Entre l'Eglse et la Synagogue, ou Perpétuité, de la Foi de la Réligion Chrétienne," 2 vols., Paris, 1844; "Lexicon Catholicum Hebraicum et Chaldaicum in V. T. Libros, hoc est, Gulielmi Gesenii Lexicon Manuale Hebræo-Latinum Ordine Alphabetico Digestum," Paris, 1848; "Le Pieux Hébraisant," a work containing the principal Christian prayers and a summary of the Catholic catechism in Hebrew and Latin, Paris, 1853; "Documents Nouveaux sur les Restes des Anciens Samaritains" (from "Annales de Philosophie Chrétienne," Nov., 1853), Paris, 1854. Migne, Dictionnaire des Conversions. An autobiography is contained in Drach's Harmonie Entre l'Eglise et la Synagogue.